The party’s politburo met in Beijing chaired by President Xi Jinping to settle the “Tibetan question” once and for all. No unauthorised reincarnations will be allowed. China’s Communist government wants to interfere in purely religious matters, exploiting traditions that precede the People’s Republic by centuries. For Tibetan lawmaker, this “is ridiculous at best”. Beijing (AsiaNews) – The standing committee of the Politburo of the Communist Party met in the Chinese capital on 30 July week in a closed-door “conclave” to discuss the ‘Tibetan issue,’ namely the next reincarnation of Tenzin Gyatso, the current Dalai Lama and fourteenth Avalokiteśvara (embodiment of the compassion of all Buddhas), as part of the measures needed to stabilise the province and counter “separatism”. Although China’s Communist Party officially describes itself as atheistic and materialistic, "The authority of the central government has always been important in the reincarnation process. Historical precedents have clearly shown the central government's vital role in the process,” said a politburo statement cited by state-owned Xinhua news agency. An anonymous source told AsiaNews that at the end of the meeting Xi Jinping said that the Communist Party would pick “the next Dalai Lama, period! If things do not go well, we are ready to take corrective action." This is no mean feat. Tibetan Buddhism is still deeply felt and practiced in Tibet and the rest of the country. Its current spiritual leader is very popular despite living in forced exile. Ever since he fled to India in 1959, the Chinese government has tried to undermine his authority, but without success. 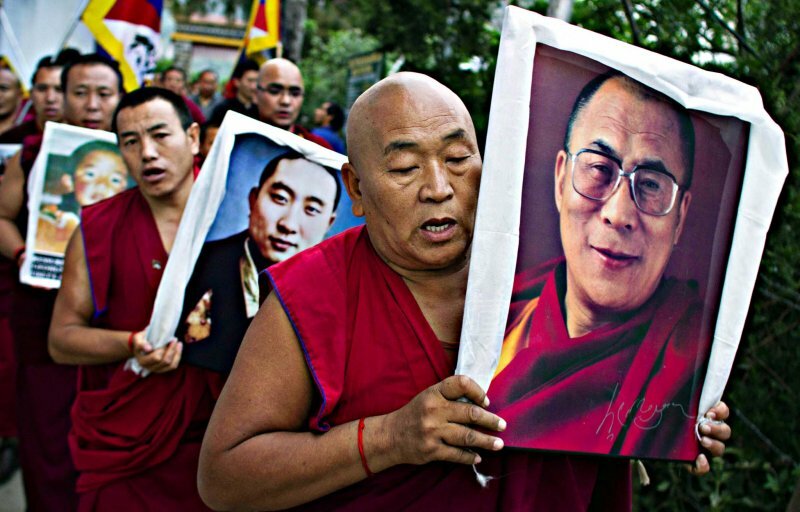 In order to undermine his power, Chinese authorities have broken the tie between the Dalai Lama and the Panchen Lama (the second highest-ranking lama in Tibetan Buddhism) by abducting a boy identified as the legitimate ninth Panchen Lama, and placing a pro-Beijing puppet at the helm of the Gelug (Yellow Hats) school. According to Tibetan Buddhist tradition, monks charged with recognising the incarnation of a living Buddha must identify a child who shows signs that would identify him as the reincarnation of the last spiritual guide. To do this, monks start their search from the direction of the deceased Dalai Lama’s last gaze and seek supernatural signs regarding infants and children in the indicated area. Once a possible heir has been identified, he is subjected to a series of tests to see whether he can recognise objects that belonged to his predecessor. In a room with thousands of slippers, the current Dalai Lama recognised immediately those that belonged to his predecessor. According to another, more recent but still valid tradition, the search involves a complex religious ritual that can take only place in Beijing’s lama temple, home to a golden urn given by a Manchu emperor to the Regent of Tibet. The names of some of the most important living Buddhas of the past three centuries were selected. Based on this practice, which was abandoned after Mao’s takeover and the birth of the People's Republic, China today claims the right to control the next reincarnation. There is nothing unusual about this. Under the current regime, the authorities have also tried to control the selection and appointment of the country’s Catholic leadership in the country. Although choosing high-ranking clergy is purely a religious affair, Beijing has relentlessly pursued a policy of keeping religions under control, including their assets and membership, this despite the fact that the Dalai Lama and the various popes elected after Mao’s revolution have clearly indicated that all they want is religious autonomy from the state. “The claim of Chinese government’s regarding the reincarnation of His Holiness the Dalai Lama is ridiculous at best,” said Karma Yeshi, a member of Tibetan Parliament in exile, cited in Phayul, a Tibetan news website. “If we look at the history from the first to the current Dalai Lama, there has been no such incidences to authenticate such claim. If they are referring to the patron-priest relationship, Tibet had such relationships with other nations like Mongolia” or Korea.